Hanstholm passenger and car ferry ticket prices, timetables, ticket reservations and information for ferries sailing from Hanstholm to Lerwick, Shetland or Torshaven, Faroe Islands. Compare all available Hanstholm ferry ticket prices in real time and book the cheapest available Hanstholm car and passenger ferry tickets sailing to and from Hanstholm, Lerwick, Shetland or Torshaven, Faroe Islands with Northlink Ferries or Smyril Line ferries online with instant confirmation. Book Hanstholm Ferry Tickets with Northlink Ferries or Smyril Line for ferries sailing from Hanstholm to Lerwick, Shetland or Torshaven, Faroe Islands online in advance to enjoy the cheapest available ferry ticket price. The price you see is the price you pay. There are no hidden extras or surprises such as added fuel surcharges or booking fees and we do not charge you anything extra for paying with a Visa Electron card. The price we quote you for your selected Hanstholm passenger or car ferry ticket, onboard accommodation and vehicle type is all you will pay, and that's a promise. To obtain a Hanstholm ferry ticket price and book your ferry ticket securely online please use the real time ferry booking form on the left. You are also able to add a hotel at your destination, or anywhere else, to your ferry ticket when completing your ferry ticket reservation. Hanstholm is located on the northern edge of a salt dome, and this edge consists of very hard chalk, which is the reason that ice age erosion did not remove these formations. Because the ocean currents in this area prevent the ocean from freezing, and because of Hanstholm’s geographic location, it is the perfect place to have an harbor that is able to be open all year. In 1917, the Danish parliament decided by law to build a harbor in Hanstholm. When Germany occupied Denmark in the Second World War, they stopped all construction in June 1943, removed all machines and blew up the buildings on the beach. After the Second World War, a political struggle started to get the harbor finished, but the other harbors in Denmark feared this. A new law saw the day of light on April 29, 1960. Finally, the harbor was completed and opened in 1967, and today it is the biggest harbor in Denmark. The port is served by the weekly Smyril Line ferry to the Faroe Islands, Shetland Islands, Iceland and Norway. Port of Hanstholm has, besides being the biggest fish market in Denmark, been a major ferry port, where the ferry companies have exploited Hanstholm's position between Norway and the destinations of the Atlantic Ocean. The port's location also makes it an important player in the efforts by Denmark and the EU to move as much freight traffic as possible from land to sea. Where there are big quantities of fish and lots of traffic - a rich business life dealing with goods and services of various kinds has bloomed - and this has happened quite naturally in Hanstholm; from fish grading, fish auction, fish processing and fish export businesses to goods and transportation, cold stores and services of various kinds - blacksmiths, cooling plant operators, floating dock and trawls - all is to be found at Hanstholm (*see adresses etc. at the website) and continuous user analysis show that Hanstholm is really good at servicing. Best Price Guarantee - We always offer you our lowest available Northlink Ferries or Smyril Line passenger and car ferries ticket price to and from Hanstholm. There are no hidden extras or surprises such as added fuel surcharges or booking fees and we also we do not charge you anything extra for paying with a Visa Electron card. The price we quote for your selected Hanstholm ferry ticket, onboard accommodation and vehicle type is all you will pay, and that's a promise! In the unlikely event you find the same all inclusive Hanstholm ferry ticket cheaper in the brochure of any other tour operator we promise that we will do our best to beat that price or offer you the choice of requesting a refund. 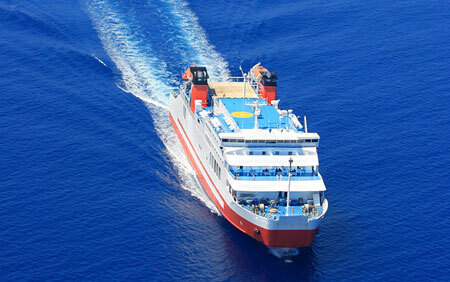 To book Hanstholm car and passenger ferry tickets please click here. At ferryto.co.uk you are able to obtain live Hanstholm ferry ticket prices, check availability and book car and passenger ferry tickets to and from Hanstholm at our lowest available ticket price. Ferryto.co.uk is part of the world's largest online ferry ticket distribution network providing the ability to book over 80 major European ferry operators including to Hanstholm and to over 1,200 other ferry routes throughout the UK, France, Spain, Ireland, Holland, Eastern Europe, the Mediterranean, the Baltic and North Africa.